The willow is finally ready!! I went to my favorite willow cutting place over the long weekend and did a big cutting to make baskets over the next couple of weeks. Actually, my husband did the dirty work, gotta give credit where it's due! Thanks dear! The willow is really nice this year and the mosquitos weren't out which was a relief! 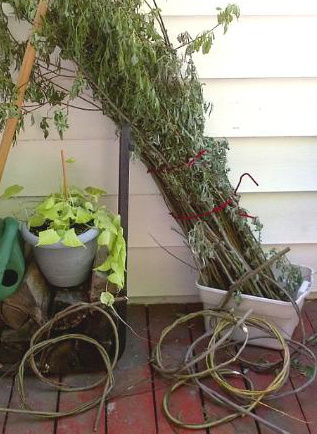 If my arthritis co-operates, I will be teaching several different baskets this season including: naturals made from willow mixed with commercial rattan, Shaker cat heads, market baskets, hanging weed pouches and a mail basket. If time and the strength in my hands allows I will add a few more designs. I just received an order from Stampin Up! 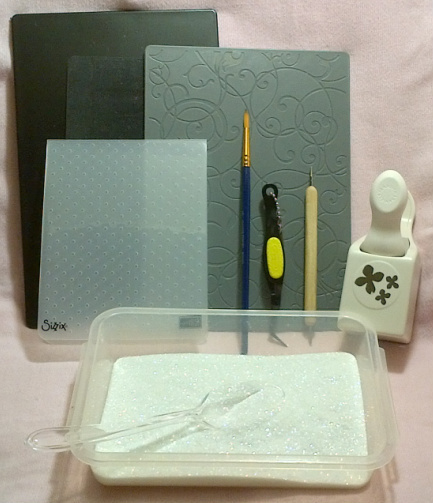 which contained a new Whisper White Craft ink pad. The craft ink has a longer 'open' time so it's great for embossing as the powder will stick to it while embossing with a heat gun and it can be used for regular stamping so it does double duty. I noticed that the ink pad was made of foam rather than the hard fabric type I prefer. After reading the SU! website I discovered that they are switching all of their ink pads from fabric to foam. I have used foam ink pads in the past and find that they overload the stamp with ink and cause 'ghosting' because the ink gets all over the edges of the stamp. I know Stampin' Up! would never introduce a new product without copious testing and consumer input, so with an open mind, I inked a stamp and tested it out. YUK!! I got ink everywhere even though I was very careful not to over ink. I've been practicing with it and can stamp with about a 50% success rate, but it is very frustrating and wastes a lot of paper. I would never use it to stamp directly on a card front and risk smudges and smears. 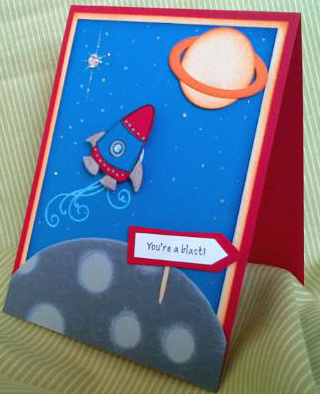 I emailed Stampin' Up! and let them know about my lack of success as did my SU! demonstrator. What do you think about this product change? Do you like foam or fabric? I would love to know your opinions. While craft shopping a few weeks ago I saw an intriging new product - Wobbles. 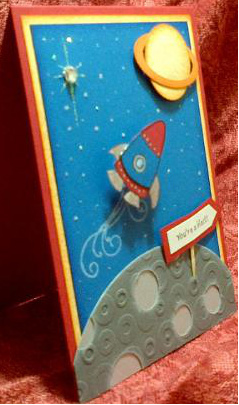 They are a plastic spring with peel and stick adhesive circles attached to each end so that you can mount things like stamped images to your card front and to make them wiggle about. They are a little expensive, so you know me, I made my own version. I bought some 28 gauge wire from the Dollar Store and wrapped a piece around the end of a paint brush to create a spring. Then using Scotch Tape, adhered punched cardstock circles to each end so I could attach an image and mount it to a card front. It worked beautifully!! The little rocketship (SU! 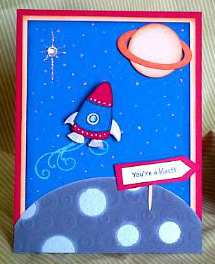 Pun Fun Stamp Set -retiring) wiggles about when flicked and really adds a layer of interest to the card front. Sorry the pics are a little blurry, my camera has a temper! Give this technique a try, it's quick inexpensive and fun. Doesn't get any better then that!! I love weddings! Getting together with family and friends to celebrate love and life, eat some good food, have a glass of wine and maybe even enjoy a dance or two is just about the most fun allowed! 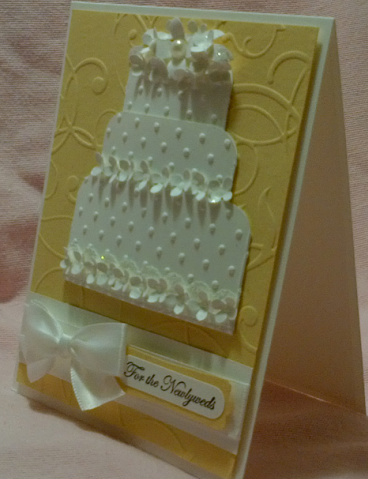 The other thing I love about weddings is designing and making a special card for a special couple. 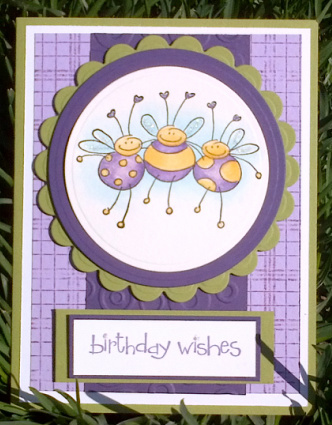 This card features Martha Stewart's floral punch, Stampin' Up! 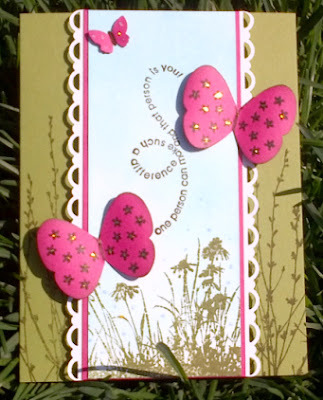 Swiss Dot embossing folder and Swirl embossing plate and a touch of SU! Dazzling Diamonds glitter dust. The cardstock used is SU! 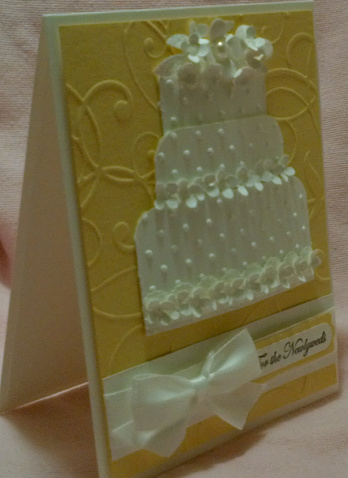 Very Vanilla and Bazzill's textured pale butter yellow, embossed in Swirl. 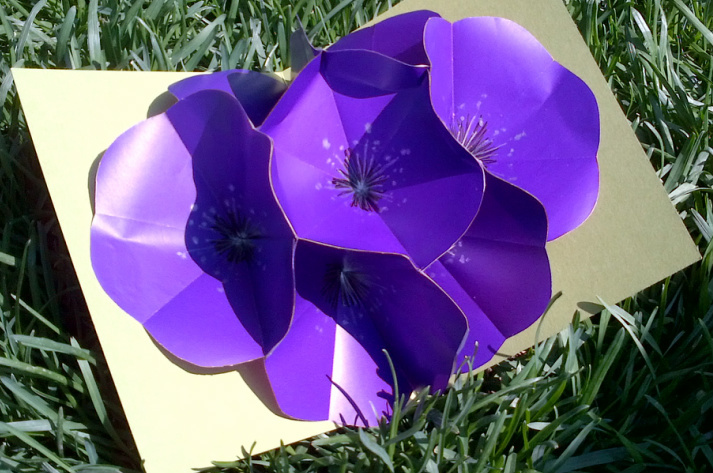 Using a tight circular motion and a stylus, or even the end of a paint brush, adds shape and dimmension to the punched flowers. 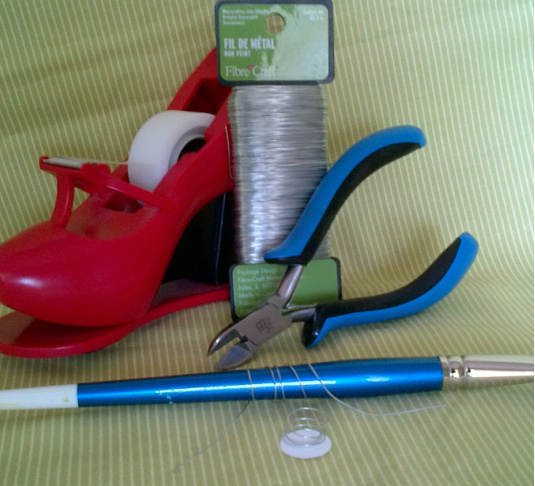 One tool I can't live without when doing 'fiddly' work on a card is a good pair of tweezers. Now all I need to decide is what I'm going wear!! When I was a little kid in grade 1, I remember getting into trouble from the teacher for coloring a picture of a frog purple instead of green. When she asked me why I had done it, I told her that I knew frogs were green, and that I'd colored the frog purple because it was a picture and it wasn't real! I have loved purple ever since! I made a card a few days ago using this stamp and was looking for an image that would go with the purple flower explosion on the inside. I saw the bees on my desk and decided purple bees would be just fine! They are colored using Distress inks and markers loaded onto a glass plate, then picked up with a wet watercolor brush. Stickled the wings and 'feelers'. Now that my daughters are home for the summer, I am going to get one of them to show me how to make a video so I can post a tutorial on the exploding flower. Stay tuned! I haven't been writing this blog very long, I started it over the Christmas break 3 1/2 months ago. I make a New Year's resolution each year, and this year I decided to improve my computer skills and thought writing a blog about what I love to do would be a way I could teach myself at my own pace. I learned something new today. Blogspot has recently changed their blog format,which upset my tea kettle, but it actually helped me explore 'buttons' that I would otherwise be a bit nervous to press! My daughter keeps telling me the only way to learn is to 'press stuff and see what happens'. So I did. I checked my blog statistics while exploring today and discovered to my total surprise that my little card making blog is being read by people all over the world! This may not be a big surprise to some of you more computer savvy types, but I am amazed! 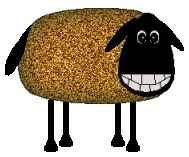 I sit in my little craft room typing my blog entries in with one arthritic finger, and somehow thought that the World Wide Web would just absorb what I do like liquid into a sponge. 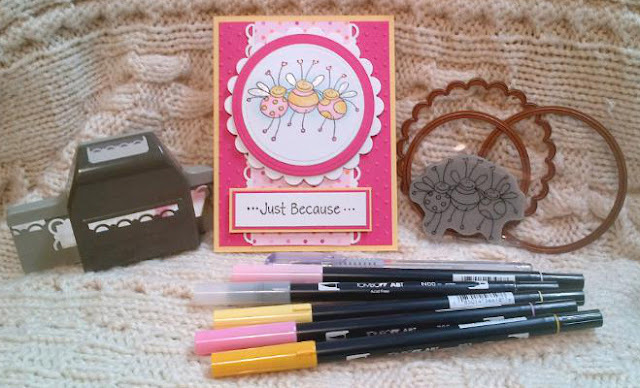 Just imagine my surprise to discover that card making is alive and well in New Zealand, and people are reading my blog in Sri Lanka, Indonesia, Alaska....Wow. Hello everybody. My two girls are home from university for the summer, and our house has come to life! It was so quiet around here, and it's so nice to have my family together again! 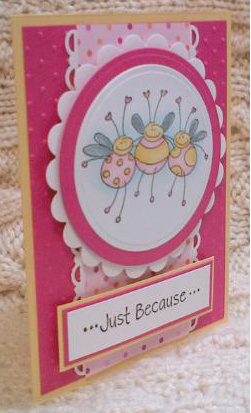 I saw this stamp while rifling through my collection today and the three bees reminded me of 'me and my girls', and it inspired me to make this card. 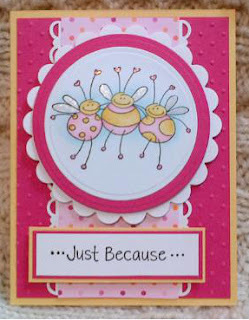 The stamp is called, "Just Bee-Cause", by Stampendopus, I think! I have a bad habit of throwing packaging away before I read what's in it! I posted yesterday that I was experimenting with Tombow markers, and used the same technique to color these bees. It definitely takes some practice and I am not an expert by any means, but I am learning!